An architect in Santa Monica California is designing a large residence to be built near Dodger Stadium. The garage is 49,000 square feet. Calculations show it needs just over 36,000 CFM. The first draft of the design uses a huge axial fan that pulls 10,000 watts or so to its 15 HP motor. There are over 300 feet of custom ducting with sizes ranging from 14 inches by 28 inches up to 20 by 80 inches with 6 tapered transitions along the lengths. Added to that are 8 big 40 inch by 18 inch grilles. The most important outcome of the garage case is that the electric power use was dropped from 10,000 watts to 1,638 watts and the ventilation without power was increased from zero to over 15,000 cfm due to gravity and wind power alone. 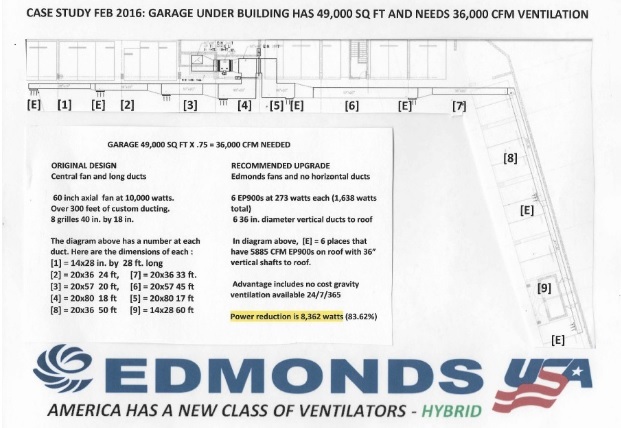 The alternative shown below eliminates all the horizontal ducting and uses 36 inch vertical ducts to Edmonds EP900 units on the roof.